Playing at the World: Mordenkainen, in 1974 and today. This version of Mordenkainen dates from early July 1974, so about six months after the publication of the original Dungeons & Dragons rules. 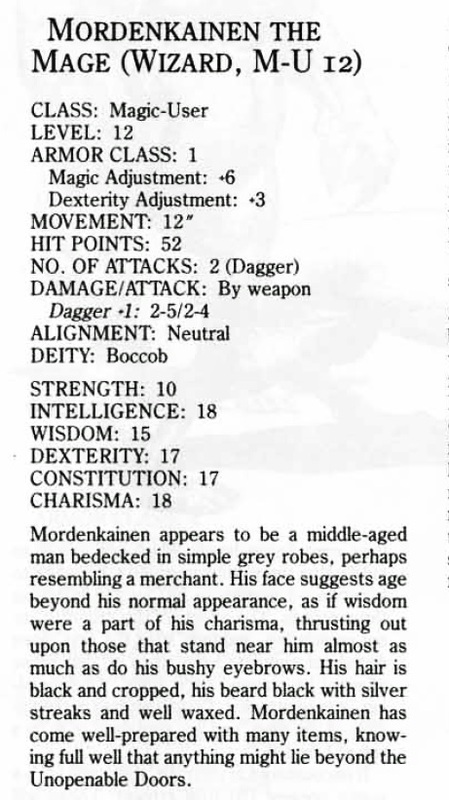 In May, Gygax had printed a story in Wargamer's Digest relating one of Mordenkainen's less-successful adventures (read the whole article online) which then listed him as a 13th level magic-user, so the statistics from this letter surely reflect the character of that era. Mordenkainen was a seasoned adventurer by this point -- though with his prime requisite Intelligence of 18, Mordenkainen enjoyed 10% experience boost that may have speeded him through the ranks. Any document from this period will exhibit a few historical curiosities. We may wonder at the absence of Mordenkainen's hit points or armor class, but early character records, including official sheets made by TSR in 1975 and 1976, often did not record those values. Mordenkainen's current experience total is also revealing: the original 1974 rules only give experience thresholds for magic-users up to the 11th level, which is achieved upon accumulating 300,000 experience points. To attain the 9th level rank of Sorceror requires 100,000, and a 10th level Necromancer needs 200,000, so readers might assume that levels above 11th require a further 100,000 each. That would mean getting to 13th level at 500,000, and 14th at 600,000, and so on. But in this letter Gygax is using a different metric for higher-level Wizards: under what he calls the the "old system," having 772,100 experience would place you at only 13th level. He also alludes to the fact that a new system then in use would require 1,200,000 to reach 14th level. That figure is closer to the one published in Advanced Dungeons & Dragons, where a magic-user requires 1,500,000 experience to reach 14th level. Already, half a year into the publishing history of D&D, Gygax had concluded that the original experience requirements were far too generous. By the time we look at Mordenkainen in the 2002 Epic Level Handbook, say, the core rules of D&D had shifted so much that comparison is basically pointless. But it is fantastic to see that Mordenkainen is still integral enough to Dungeons & Dragons that his name and his personality infuses new products coming out today! And don't forget his appearance in Mythus under Wordenkainen. Far as I know Gary was a big fan of Finnish mythology. "We may wonder at the absence of Mordenkainen's hit points or armor class, but early character records, including official sheets made by TSR in 1975 and 1976, often did not record those values." Why was that, do you think? Did the early players tend to keep it on a separate sheet? Were exact values in terms of health often not tracked? I know Arneson purposefully hid as many statistics as he could from his players but that wasn't the Gygax way. Also never forget to cast Mordenkainen's Faithful Watchdog before wandering into a dungeon. Else you'll have to argue with the DM about whether or not you did. As I recall, at one point hit points were not a static number rolled once per level, they were rolled at the start of each adventure. There would be no point to recording them permanently. Wasn't that one of the things the DM tracked in the early days? My Dad guarded his character information so closely that this article is in fact the first time I have seen them! Great post Jon. Thank you for sharing your research and insights with us. Great post as usual. Always interesting. That parenthetical note about Mordenkainen's XP total and level seems to solidly verify that the intent was that the amount of XP required to achieve "name" level was the same amount required per level thereafter (so a fighter needs 240K XP per level above Lord, a magic-user needs 300K XP per level above Wizard, but a cleric only needs 100K XP per level above Patriarch). This perhaps shouldn't be surprising since it's consistent with the note on the thief in Greyhawk (125K XP to Master Thief +125K per level thereafter), but not with later editions of the "Classic D&D" line, starting with the 1981 D&D Expert Set, where fighters' and magic-users' XP requirements per level above name level are 120K and 150K, respectively. AD&D goes in the other direction - keeping the per-level XP requirements for fighters and m-u's roughly the same as OD&D (at 250K and 375K respectively) but substantially increasing them for clerics (to 225K/level) and thieves (to 220K/level). If clerics and thieves above name level gained levels at 2-3x the rate of fighters and magic-users in OD&D, that helps explain why per Greyhawk they only gain 1/2 hp per level. Is the XP requirement for Wizard 250K in the Guidon D&D draft? If so, that would match 772K XP being 13th level under the "old" system (i.e. 250K to 11th, 500K to 12th, 750K to 13th) while 1.2M XP are required for 14th under the "new" system - 300K to 11th, 600K to 12th, 900K to 13th, 1.2M to 14th. The methodology didn't change, but the table values did. Don't forget Mordy has another stat block in Dragon #37! I agree, Trent. Gronan has indicated such, so it's nice to get confirmation here. The 1200K for 14th level MU fits with the 300K per level after name level, but the note indicates this as the "new" system. And Jon dates this as 6-months after publication. So the question remains as to what was the "old" system, and which system was in use at the time of publication of D&D. It's possible that the "old" system may refer to what Gygax was using pre-publication, such as that found in the Guidon D&D draft. If that system is the same as preserved in Beyond This Point Be Dragons, Wizard 11 required 200K, and if 200K were required for each level thereafter, 13th level would require only 600K, which would fit with Mordie being 13th level. So it's possible Mordie got to 13th under the pre-publication system, and was grandfathered in as 13th level under the "new" (published) system. That is probably about right, yes. I was popping in to say about the same thing. Thanks for crunching that. Dave Arneson was (and still is, for that matter) a grand DM. His toughness started at the onset of the adventure--Gary and myself were allowed to choose only three magical items each. Dave thought our item lists were over burgeoned with goodies. Robilar: +3 sword, Girdle of Storm Giant Strength, Boots of Flying; Mordenkainen: Staff of Power, Bracers of Protection AC2, Ring of Wizardry (doubled 4th and 5th level spells). We were each allowed to bring one curative potion in addition. The version of the story in the El Raja Key Archive offers some alternate takes on the action, but doesn't otherwise shed light on the stats of the PCs, alas.